I bloody love markets. They have the ability to transport you to exotic destinations in your own backyard, feeding and exciting the senses as you wind your way between makeshift isles. 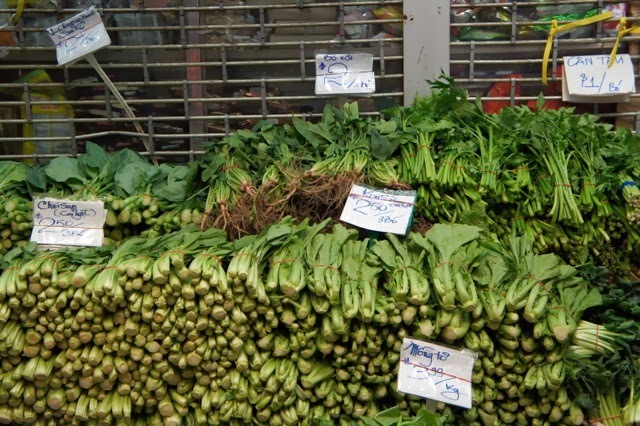 Recently I had the good fortune of being invited to two tours, both of which included magnificent markets. In this two-part series, I’m going to share these experiences. The first was the Eat.Drink.Westside tour, organised by Lauren Wambach of Footscray Food Blog to promote the area in association with Melbourne Food and Wine Festival 2014. Her sought-after event, Rickshaw Run, is sold out, but you can check out other Footscray food fest happenings here. Disclaimer: I did not pay for this tour, Lauren hosted me. As always, the opinions reported are based solely on my thoughts at the time of my visit. I arrived in Footscray with high expectations, having eaten at a couple of restaurants in the area before. There were five stops during the Eat.Drink.Westside tour, and they couldn’t have been more diverse. 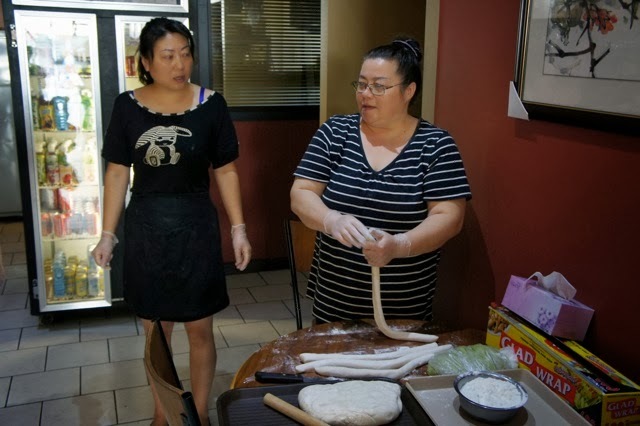 Footscray has been hit with different waves of migration over the years, starting with Chinese, followed by Italian, then Vietnamese and finishing with Ethiopian. If you want a hit of culture without the airfare, Footscray is the place to visit. I was running a little late to the tour, so I was pleased I knew where I was going. I had already visited 1+1 upon Lauren’s recommendation during my hunt for Melbourne’s Best Dumplings (Epicure article here). I’d previously tried the green, pan-fried veg dumplings and steamed lamb buns pimped with pepper, onion and a hit of cumin. But today, I was going to learn how to make them. We were introduced to owners Amy and Julia who come from Xinjiang in the far north-western corner of China. 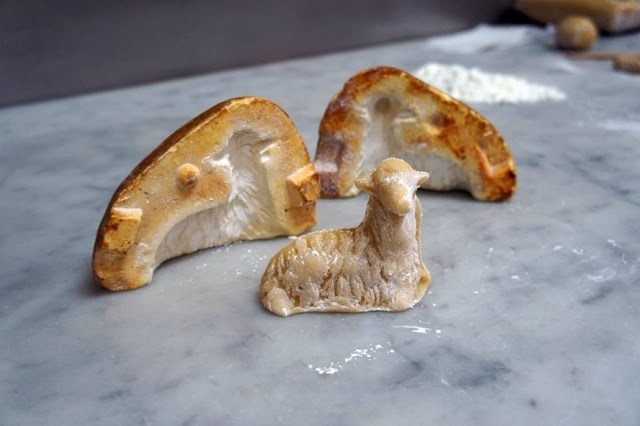 It’s close to the borders of Kazakhstan, Mongolia and Russia, which explains the cumin in my favourite lamb buns. 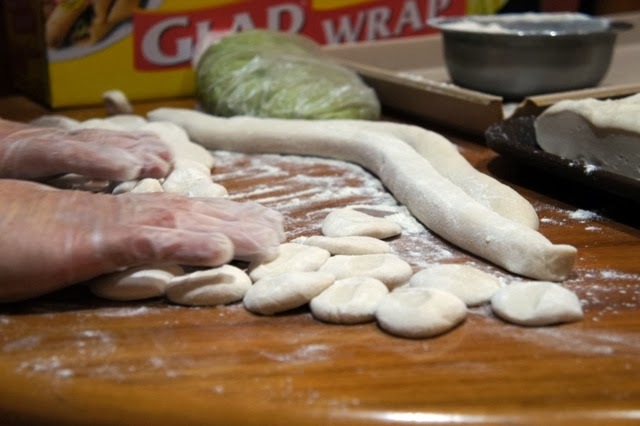 We were given a demonstration and taught how to roll, fill and pinch lamb dumplings into passable parcels. I was surprised at how easy it was. 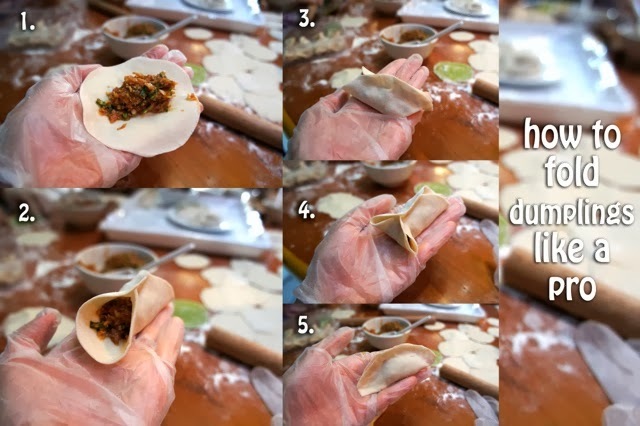 Lamb dumplings are the specialty (as opposed to pork) due to the prevalence of the Muslim Uyghur, a large minority group that make up 60 per cent of the population in Amy and Julia’s home city, Urumqi. We worked up an appetite rolling all those dumplings, which were packed, named and refrigerated so we could take them home at the end of the tour. Our intimate group of about 15 walked a few doors down to our next stop – I couldn’t have asked for a better snack to keep me going until lunch. 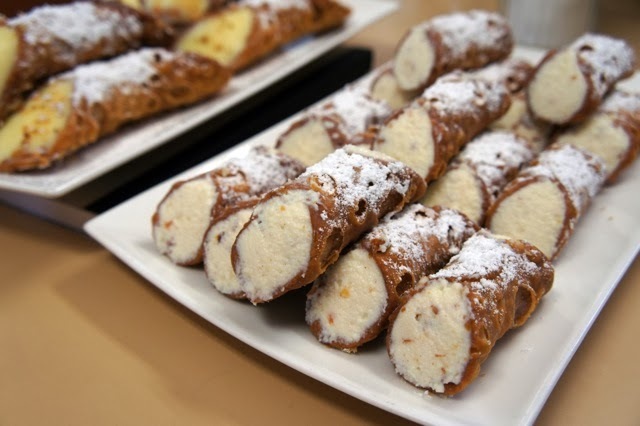 Usually I’m not a huge fan of cream (I’ve been known to say, “Why have cream when you can have ice cream?”) but who am I to turn down Melbourne’s best cannoli? 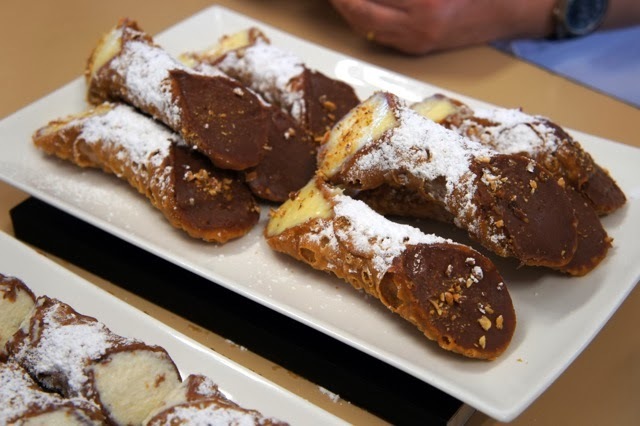 Cannoli is a Sicilian dessert, the name translating to ‘little tube’. Lauren had planned for us to check out the small shop in two groups, but owner Tony Cavallaro insisted no one should be made to wait on the street. 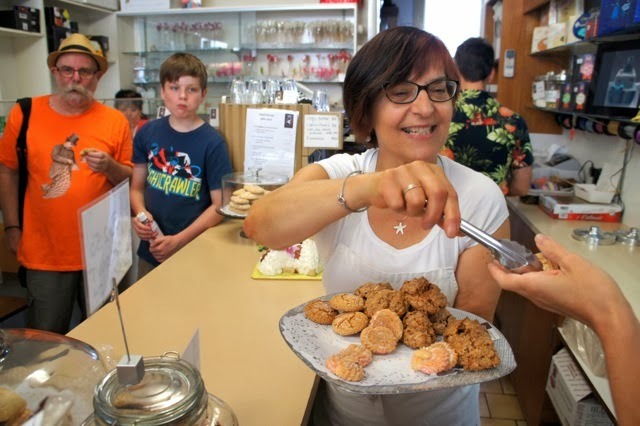 We crammed into the shop front, where regulars picked up orders as we cruched into crisp cannoli pastry shells shooting velvety mascarpone into our mouths. Tony explained the history of the pasticceria, set up in 1956 by his parents. The recipes have been passed down and remain unchanged, including the soft, chewy amaretti biscuits. 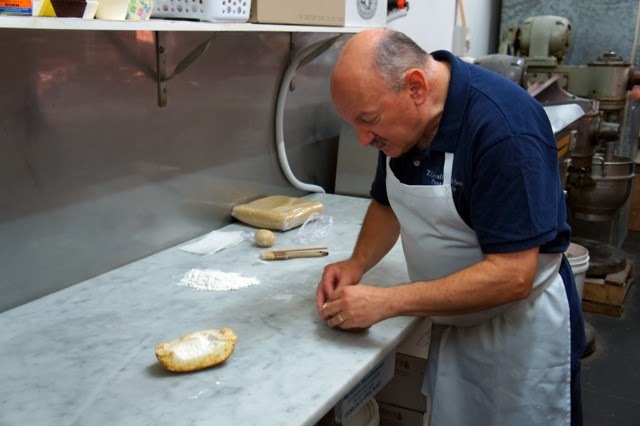 Our group took it in turns to follow Tony into the kitchen, where he glowed like a junior school preppy during ‘show and tell’ as he presented the 120-year-old plaster mould his grandfather brought over from Sicily to make agnello pasquale. 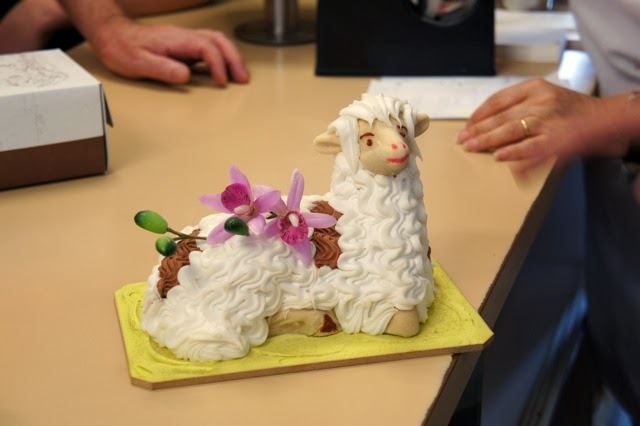 He passed around the base mixture used to create the traditional Easter lamb cake; it resembled and tasted like firm cookie dough. He stuffed it inside the mould, which had crevasses carved out to create the appearance of sheep’s wool, pressed it tight, and in no time at all a little lamb sat before us. Upholding 130 years of family tradition isn’t always financially viable. In the case of agnello pasquale, it is, but for Tony, tradition always comes first. “Even if I didn’t sell any, I’d still make them,” he said. I resisted the urge to hug Tony goodbye as we walked back out to the street. We were on the way to Little Saigon Market, but had a couple of stops to make on the way. Hopkins Street, Footscray, has quite an industrial feel, and yet it’s booming with restaurants and culture. We turned a corner and elderly locals with the kind of faces that tell stories squatted on the sidewalk behind blue tarps scattered with lemongrass stalks and aloe vera. Memories of holidaying in Hanoi, Vietnam, rushed to mind. Lauren pointed out D & K Live Seafood (3/28A Leeds Street, Footscray), a shop with a wet concrete floor, blue walls and tanks swimming with live critters. Each tank is clearly marked so customers know whether the fish are farmed or caught wild. 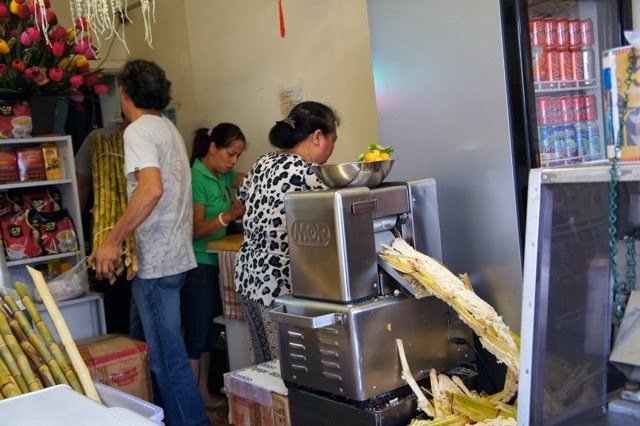 Around the corner from D & K is a hole-in-the-wall shop serving sugarcane juice and Vietnamese coffee. We parked ourselves outside and cleared a path for two men carrying bundles of sugarcane from the back of their truck into the minuscule space. 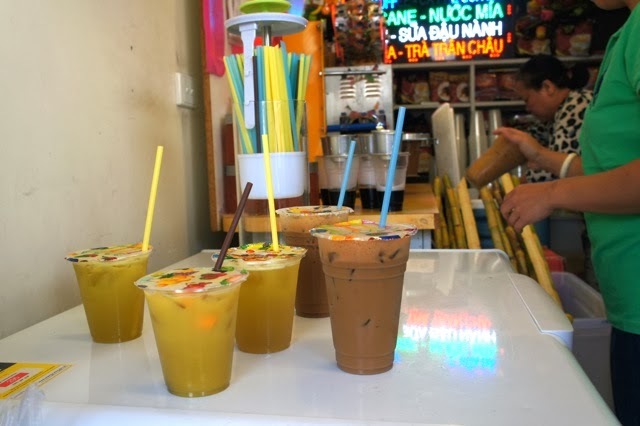 The store holder pushed poles of sugarcane through a wringer that squeezed yellow-green juice from the fibrous sticks into a jug, tossing in a couple of cumquats to balance the sweetness. The Vietnamese coffee wasn’t as sugary as ones I’ve had in the past, with the perfect amount of sweetened condensed milk added for my personal preference. It was just the refresher we needed before braving bustling Little Saigon Market. 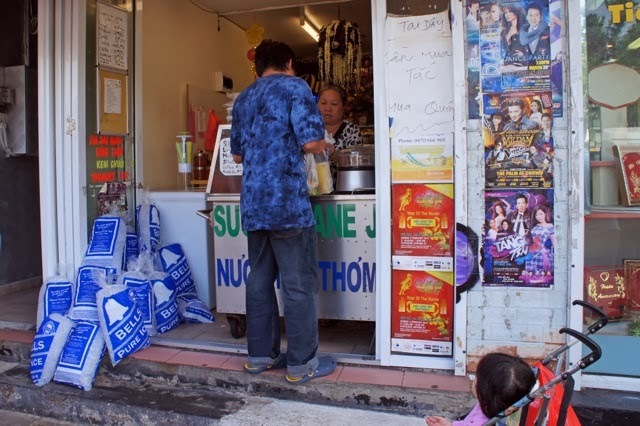 Little Saigon Market isn’t as familiar to visitors as nearby Footscray Market. The former is more exotic, overflowing with tropical fruit like rambutan, mangosteen and longan, as well as Asian greens and vegetables you wouldn’t know what to do with unless instructed. 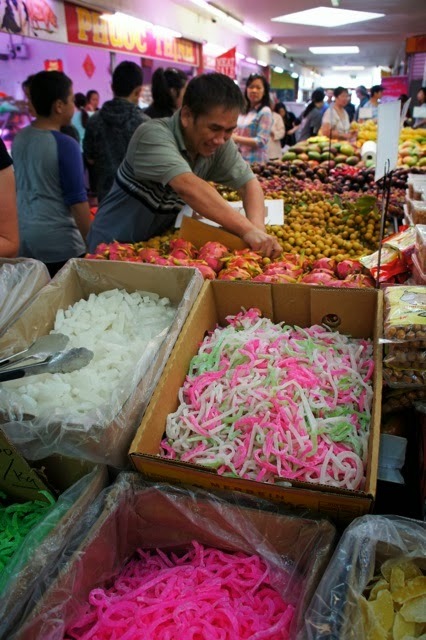 Big boxes of brightly coloured Chinese New Year sweets were dotted around the market when we visited; candied water chestnuts, lotus seeds and coconut, just to name a few. Bain-marie cafés near the Nicholson Street entrance sell home-style Vietnamese food you won’t find in the city (such as intestine), and regular market-goers get their energy fix from packets of deep-fried calamari, described by Lauren as “Little Saigon’s answer to hot chips”. Everything is available to try, with kids diving on plates of sliced mango with chilli and sugar and shopkeepers slicing segments of nectarines faster than you can eat them. “Try another, try another” – they’re wonderfully relentless. 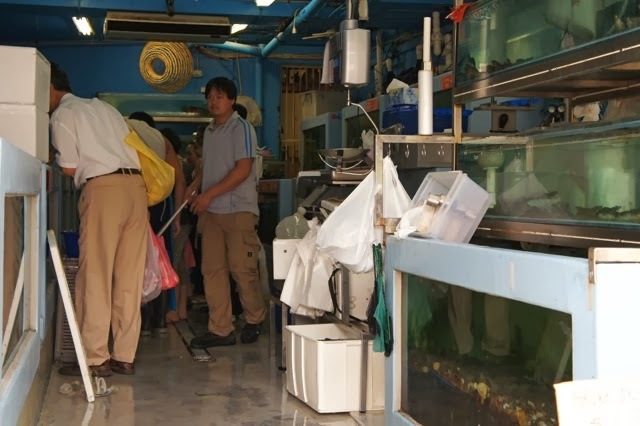 As we were being force fed, a giant crab escaped from a plastic blue box at a seafood store nearby, crashing onto the tiled floor and attempting to scatter away. It doesn’t get much fresher than that. 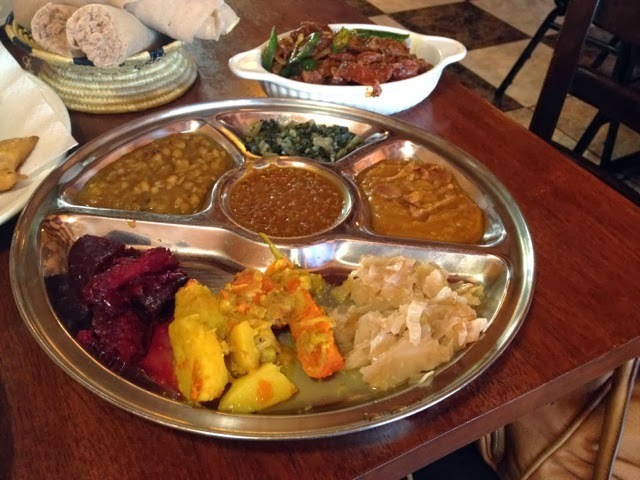 We strolled back around to a popular Ethiopian restaurant for a traditional banquet, courtesy of the gorgeous owner Mulu Tiruneh, a woman who has a tendency to simultaneously clear plates and dance. We could smell spices from the street before the door was even opened. This was my second visit, and it was just as good as the last. 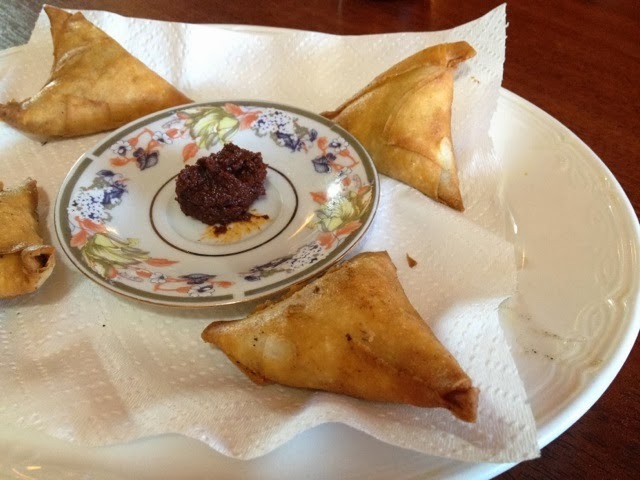 Previously I came with a friend, enjoyed an Ethiopian beer with some samosas, a curry platter, and a brilliant dish of raw cubed beef with jalapeño. Lauren pointed out that Dinkesh Lucy is unique as it’s one of the only restaurants were the sour, spongy injera flat bread is made onsite. You have to call ahead so Mulu knows how much to make the day before. 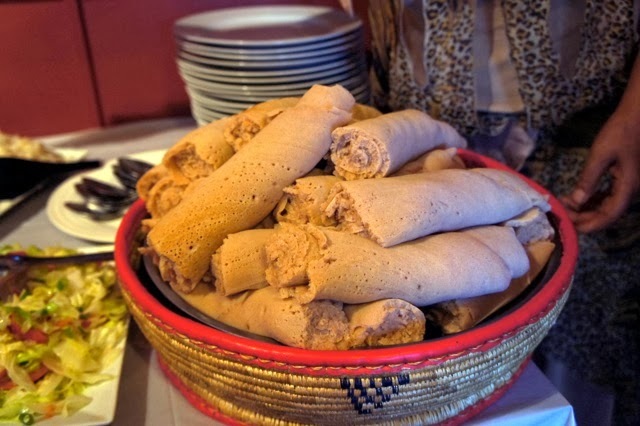 She creates her lightly fermented batter from teff flour, and it eventually resembles a rolled-up, oversized pancake. 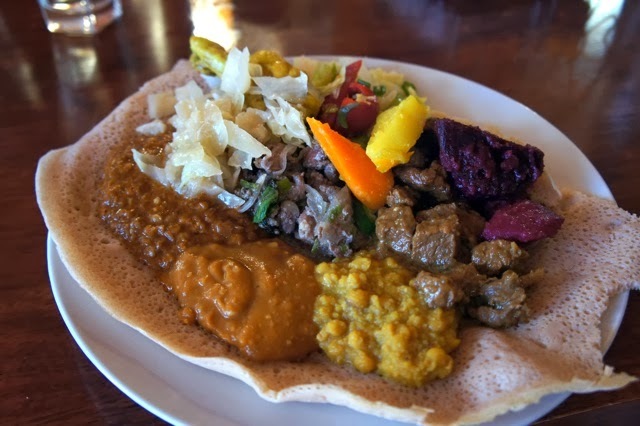 The idea is to spread it over your plate, plop your curries on top, and then break the edges off the injera and use it to scoop up your food. 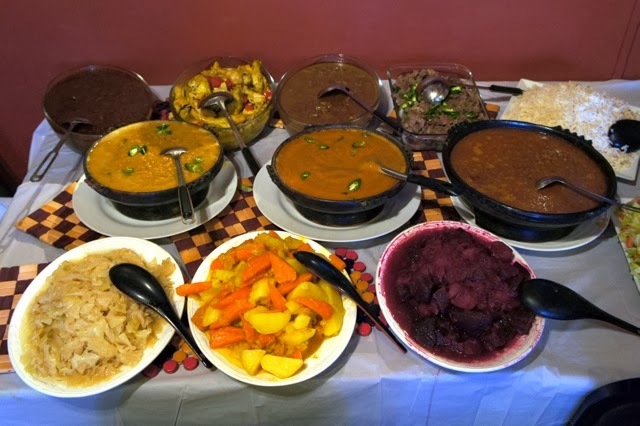 Curries of different textures, colours and flavours lay before us: lamb, beef, chicken, lentil, spiced split pea; as well as veggie sides like beetroot, cabbage and potato and carrot. By the end of the feast my eyes were watery from the influx of aromatic spices and onion. 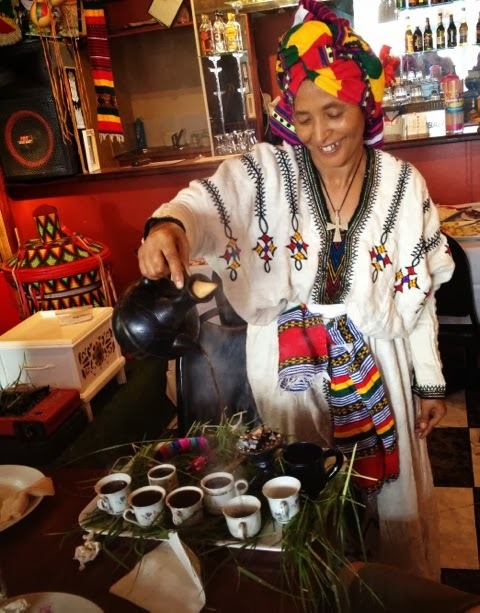 We finished with a coffee ritual, from roasting to grinding to pouring, accompanied by popcorn, which is a traditional coffee snack. The best way for me to judge a meal or event to which I am invited is to ask myself if I would do it again out of my own pocket. Not only would I go on Eat.Drink.Westside all over again, I called three people on the way home to blurt about it. We started with dumplings, moved on to cannoli and sugarcane juice, sampled Chinese New Year sweets and exotic fruit, before finishing with an Ethiopian feast. 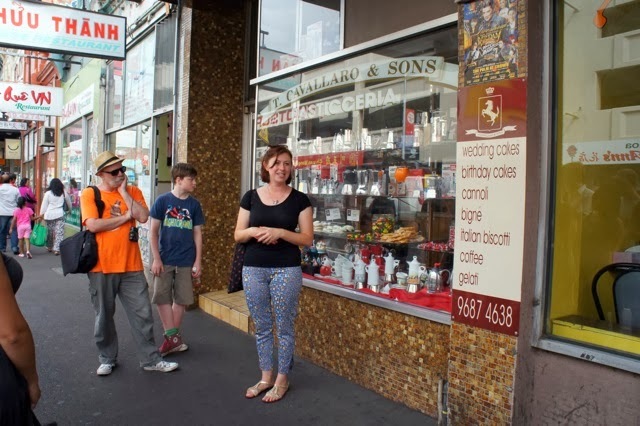 Our city may be trans-cultural, but few areas as small as Footscray are as diverse. If Melbourne is a multicultural melting pot, Footscray is the stock of the soup within the pot. I wish the sugarcane store was linked properly on Zomato. I'll write one up for the store but thanks for the review. Enjoy playing online casinos through the Internet.